Jonathon's Racing Attacks and Adventure Packs! October; Melbourne Marathon 2007; 4hr 10 . 2008 DNF at 23km..
August; City to Surf most years since 1997 see HERE for details,photos. Have also finished 19 trail ultra races; 6 inch 47km ultra finished 11 times, six foot 45km ultra 4 times, Ultra Trail Australia ultras 2 times, Truth 50km ultra once within cutoff (and once outside cutoff), Lark Hill 50km ultra once. Also completed the Bloated Goat 31km (1500m Vertical gain) 2 times which is similiar effort to a 46km ultra. DNFs in UTA100km, WTF50miler, WAMC40miler race, Truth 50km, Six foot and 6 inch. The first 3 DNFs were after covering more than 42km, and with Truth one was a 25km DNF and the first one I finished the full 50km but was 19minutes outside cutoff battling an ankle injury for 36km. In road marathons 2 DNFs one at 23km in the 2008 Melbourne Marathon due to severe ankle injury in the first 1km, and PC2S @ 30km. 12/3/2016 Six Foot Track DNF at 30km 5 hours. 30/08/15 Perth City to Surf Marathon 4 hours 00min 20 secs. 12/04/15 Bridges 10km 49min 53secs. 01/06/14 Elleker Half Marathon 1.59. 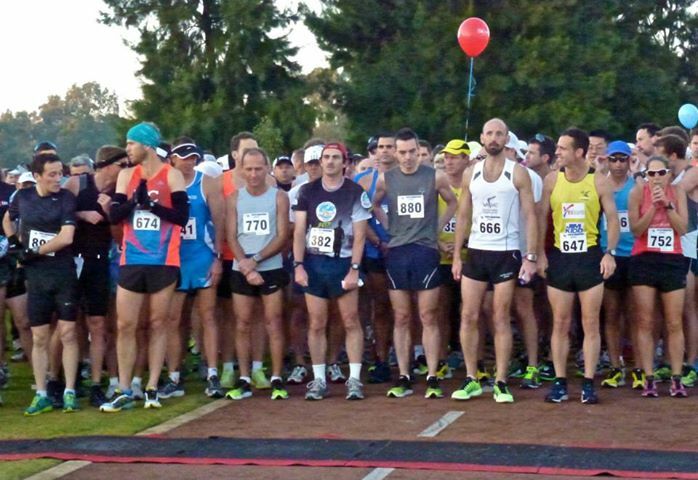 19/05/13 Joondalup Half Marathon 1hr 58min 26secs 310th of 495. 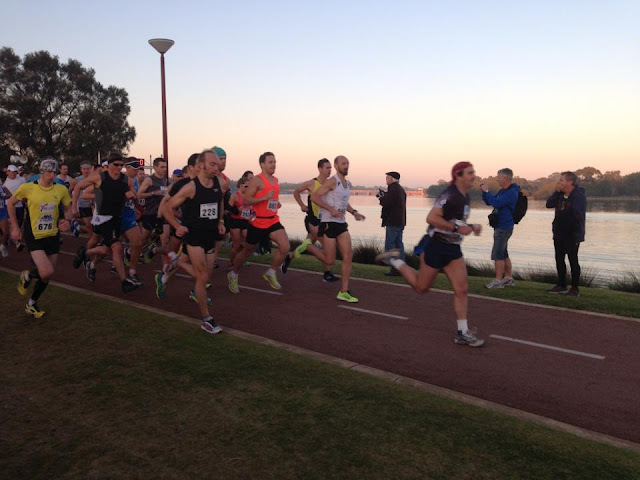 07/04/13 Bridges 10km 54min 45seconds. 09/03/13 6 Foot Track 45km 6 hours 54 minutes 20 seconds. 740th of 804...blog post or ...photos! page. 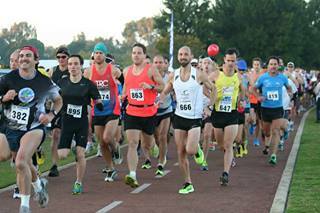 24/02/13 Perth Trail Series Qi Gong 14km 1hr 37min 04 Placed 79th of 117 finishers. 15/07/12 Lake Joondalup 10km 47min 30. 22/04/12 PTS Ellis Brook 21.8km trails race 3hrs 12min 28secs. 39th. 25/03/12 17.3km (690m ascent) Swissmurdie trails race 2hrs 19min 17secs 54th of 60. 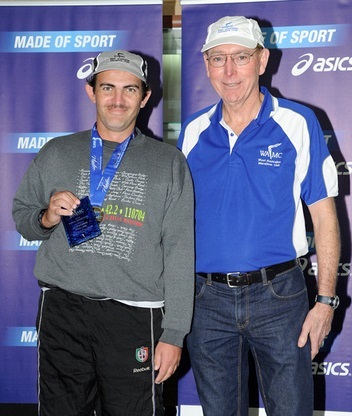 20/03/12 MastersWA 1500m in 5.56, 100m in 14.3, 400m in 76.4, 5000m in 23.33. 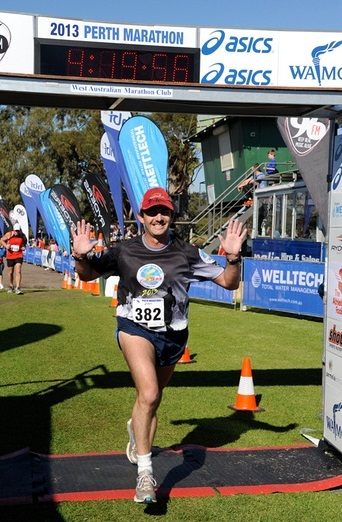 26/02/12 Perth Trail Series Qi Gong 14km 1hr 44min 08 secs 70th of 102. 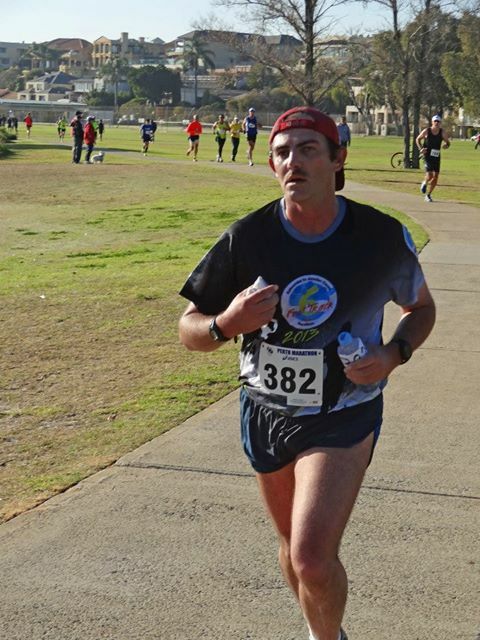 04/02/12 Busselton Half Marathon in 1hr 49min 31 secs. 18/12/11 6 inch 46km 5hrs 30min PB! 12/09/11 Fremantle 10km in 45minutes 50 secs. 7/8/11 Perth Half Marathon in 1hr 47min 46 secs. 17/7/11 Lake Joondalup 10km in 46min 33secs. Note; Completing 6 foot is a major goal achieved which I have had in mind since 2005!!!!!!! 5/2/2011 21.1km Busselton Half in 1hr 51min 41 secs for 124th of 218 finishers. 10/12/10 5000m in 22.43 18th of 18! 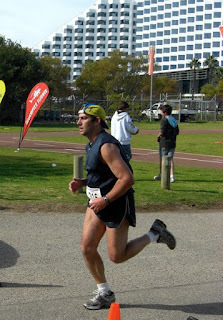 12/9/10 Fremantle 10km in 46min 53...a big SB and my best time since 2005! 29/8/10; 42.2km in 4hrs 15min for 537th of 830 finishers...my 6th best of 12 M. finishes. 20/6/10 Perth Marathon in 4.30. 15/11/09; Peninsula 5km 22min 5225th of 73. 2011; 5hrs 30min 6 inchPB!! 2012; 3hrs 49min PB(Melbourne Marathon)! !2014; 6hrs 47min PB! @ 6 foot! Kathryn and I welcomed our daughter K into the world May 2015 A.D.! Kathryn and I welcomed our daughter J into the world June 2010 A.D.! Kathryn and I welcomed our son J into the world in late July 2007 A.D.! Our challenge is to be good parents with the Creator Gods help! ... 2004 ...2005 ...2006 ...2007... >...2008...2009...2010 ...2011... 2012. -offline training logs since 1988. 2013 Perth Marathon 4.19 Spartan! 2011 is a 5.30 PB! 6 foot 45km conquered in 2011 Yeah!!!!!!! 6 inch 46km 2009; 6.16 PB! I was born in 1974. Scott Kep Ultra and 6 inch champion and record holder in 2013. PHATrunners The best trail running group in Perth!!!! Honoured to be on the K1K badge board. The running centre has some awesome running blogs listed and a whole lot! more!!! in 2009 the marathon, which I did. and on track to be become the biggest race in the world. 46km trails race ive done it a few times since it began in 2005. The wild west version of 6 foot, but probably not as hard, and about 50 times smaller fields...although its gathering momentum and numbers with international entrants in 2008 and huge improvements in 2009...Bronze labelling by the IAU in 2010!! SID-EN-EE 2000 Nationals 20km Walk. a pb 4 tb 3.49.52 thanks God yeah! I'm on FACEBOOK and MYSPACE also. Me leading the 800+ marathoners on June 16th 2013 Anno Domini on a cool 3 degrees morning in Perth in my 2013 6 foot track shirt. Number 228 (Roberto) won in 2hrs 24min!!!!!! Number 676 was 3rd in 2.34. The 2.24 is the fastest winning time in this event since Bob De la Motte in 1991. Bob raced this one also in 3.14. Massive thanks to Jocelyn Wilmot for this magnificent photo. Massive thanks to some legendary runners in Ryan Baugh, Rob Donkersloot, and Jeanne Ong (who got a PB in this race) for some of these pictures. Also some amazing pictures from Christina Bartels..
After a 78second 400m, I did a recovery jog to go through 1km in 4.29, hit 10km in about 50min, 19km in 1.39 (5.15 per km), and the half marathon in 1hr 53min (2nd fastest this year). 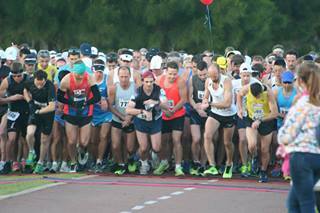 Then succumbed to the concrete footpaths, the 83kg I was dragging around the course, and my last 6km was a bit forgettable, finishing in my 7th best Perth Marathon time of 4.19. I am getting back into form and have lost 2kg this week, but need to lose another 6kg-10kg to be PB ready for Melbourne later this year. Wore my slow shoes in this one to protect my knee and back/groin from the concrete paths. The bitumen is ok, but the concrete is not. Magnificent Swan River and City views throughout on a scintillating morning. Roberto Busi (race number 228 in this photo above) won in 2.24 (5min outside course record, and fastest winning time since 1991 (23 years ago) from Chris O'Neill 2.33(obscured on Robertos left shoulder in this photo and pacing Adam), Adam Martin 2.34(gold top to right of Roberto). Kevin Matthews (2.41 PB, white singlet) and Gerry Hill who were in the top 6 are also in this photo. I think Nera Jareb (2nd woman (2.53) in a close finish with Tina Major (2.52)) is in this photo with an red runbirds top behind Gerry and Kevin. Craig Berg who did 2.52, and Rhys James who did 2.47 is also in this photo. 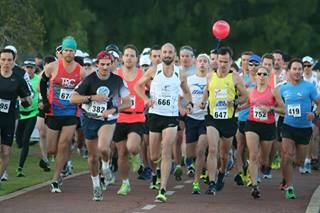 Possibly a record number of entrants and an amazing day put on by the WA Marathon Club in the 35th Perth Marathon. After the race I was presented with a plaque in recognition of my completing 10 Perth Marathons 2004-2013, which means I have now secured a spot on the Spartan list, and if I do this race again I will have a special Spartan number. Special day. Below is a photo of me getting a Spartan award for doing 10 Perth Marathons at the WA Marathon club with Gary from the club. Had a good run with the Phatties at Bold Park one night in the lead up also. Can you spot Dr R. in this photo? I did 19km in 99min47 which = 5.15 per Km pace. The 21km split of 1hr 52min 24 is 5.21 per K pace, but this slowed from 5.15 per K pace at 19km due to me walking up the new hill on the course and being a bit disappointed mentally that we were supposed to run up this hill on a concrete path rather than the bitumen road, which increased my knee pain and inflamed other injuries I have. last 700m in 5.08 pace. Started Garmin roughly 7 seconds late at the start so in total according to the GPS my total distance around 42.75km? Congrats on the ten and Spartan status Jonathon - well earned! Yes, that's a brilliant photo - you've gapped them already. Must have made the TV sports news too I presume. Worth taking it out in 78s for such a photo. Yes, drop the weight down to 70kg or so and you'll fly in Melbourne. Try Grellan's diet http://solorun.blogspot.com.au/ he's dropped 7kg and run a 2:54 marathon PB - not eating until 5 in the evening, then eat normal. A different version of the 5/2 fasting diet.